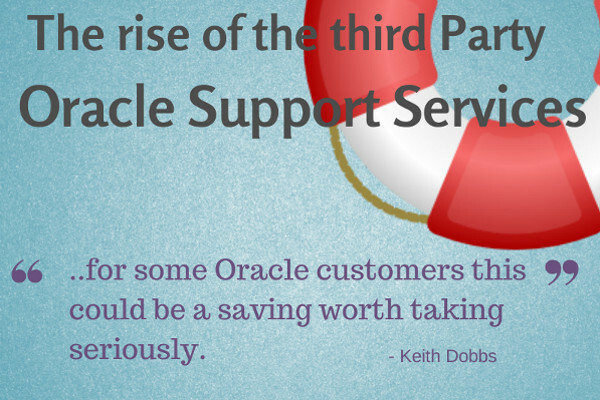 Is using third party Oracle support services like Rimini or Spinnaker a good thing? In this tough economic climate with tight IT budgets, there has been an increased focus on reducing Opex, particularly support fees. Combine this with the rise in software firms conducting ‘audits’ and firms like Madora Consulting have been kept very busy. There has also been a rise of other interesting companies focusing on providing alternative support to Oracle and SAP, even claiming 50% reductions in support fees. The oldest Rimini Street has been around since 2005. Another recent announcement was Spinnaker Support at the Collaborate 14 Oracle User Group which announced its new Oracle Database Support Service, (see Spinnaker Support Launches Oracle Database Support Services.) Clearly the lawsuit between Oracle and Rimini is not putting off new entrants, (see Oracle vs. Rimini Street each claim legal wins; Nuance abounds) . Both firms offer Oracle and SAP support. JD Edwards and Peoplesoft users seem well served here in particular. The challenge in supporting Oracle Database is that (our assumption), neither company will have access to the code base and hence cannot provide future patches or updates. We would imagine that the client would have access to all patch sets available to the end user up until the support contract switched over. It is clear that Oracle does not have an objection to third parties offering support to Oracle end users. The manner that support is provided could be an issue and hence the lawsuit from Oracle to Rimini. Madora’s view is that these third parties do have a role to play and are helpful in providing alternative support services to Oracle customers. For Oracle customers that are running an older version of Oracle database or do not intend on upgrading the version this may be a viable option. Many end users have legacy applications underpinned with an older Oracle database. The user may simply want the assurance that the support is available, lack of upgrades may not be an issue and indeed the application itself may not support newer versions. Clearly proceed with caution and take legal advice, but for some clients this could be a saving worth taking seriously. What do you think? Have you had any direct experience of the new alternative support providers? [Infographic] Are you at risk of Audit?